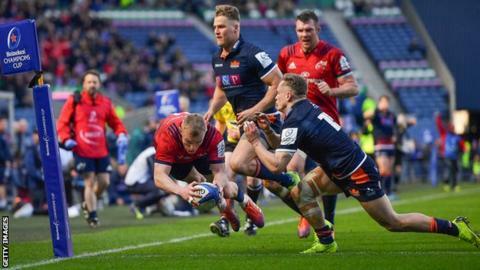 Munster came from behind at Murrayfield to edge past Edinburgh into the European Champions Cup semi-finals. The Scots, looking to reach the last four for the second time, led at the break thanks to Chris Dean's converted try and a Jaco van der Walt penalty. Tyler Bleyendaal and Van der Walt traded penalties after the interval. But Keith Earls, whose clever early score put Munster ahead, went over in the corner with 10 minutes remaining as the two-time winners squeezed through. Edinburgh had won 17 of their previous 19 European games at Murrayfield and they began with an intent that Munster had to battle hard to repel. Twice in the opening seven minutes, Richard Cockerill's team opted for touch and a close-range lineout instead of chancing their luck with a shot at goal. And twice they were frustrated by Munster's ferocious defence. Edinburgh came again soon after when John Barclay hoofed downfield, the danger only being averted when his old Scarlets pal, Tadhg Beirne, killed the key ruck. Beirne got 10 minutes in the bin for his trouble. Another chance for Edinburgh, then. And another penalty to touch. When Edinburgh surged to the posts it looked like the breakthrough was about to come, but once more Munster escaped through the organisation and power of their defence. Not only did they survive, they then suckered the hosts with the opening try while Beirne was still off the pitch. Conor Murray did not kick well for much of the day, but his box to the corner just before the end of the first quarter gave Munster the field position they needed. They had barely existed as an offensive force up to this point, but after a collapsed scrum and a quick tap penalty from Earls, the wing scampered over. Edinburgh complained about an off-the-ball Murray tackle on Henry Pyrgos in the preamble but referee Pascal Gauzere was having none of it. Joey Carbery banged over the conversion and, against the run of play and with only 14 men, Munster had a seven-point lead. It didn't last long. What Edinburgh could not do when playing with a one-man advantage, they managed to do when Munster were restored to 15. Beirne was only back on the pitch a few minutes when more sustained Edinburgh pressure finally got its reward. Munster were stretched, Edinburgh were dynamic and the gap opened up eventually for Dean. Van der Walt made it 7-7 with the boot. Game on. Munster suffered a major blow soon after when Carbery was forced off - Bill Mata had run through him earlier in the game and he looked to be struggling after that - and his loss was followed by a Van der Walt penalty five minutes before the break. A three-point lead at half-time was the least Edinburgh deserved, but even that slender lead was wiped out early in the new half when Mata was done for a high tackle and Bleyendaal punished them. That three-point advantage was restored when Hamish Watson won a penalty on the floor from Andrew Conway and Van Der Walt made it 13-10. The tension and drama only went north from there. Just before the hour, Munster banged remorselessly on Edinburgh's door. Under the most ferocious pressure, the hosts faced an attacking scrum five metres from their own line. A pivotal moment, or so it felt. The pack put in a monstrous shove and fired the visitors backwards and cleared their lines. Now it was Munster's time to scrap. Darcy Graham almost scored in the left corner and Damian Hoyland almost scored in the right. 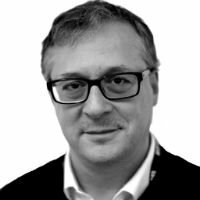 Chances came and chances went - and how Edinburgh suffered for it. Munster did not produce much class on the day, but the decisive score was pure brilliance. What turned out to be the winning score had it's origins in a penalty for Edinburgh that was reversed when Pierre Schoeman barged Beirne and, from there, the visitors moved ominously downfield. Munster did Edinburgh on the outside, attacking with an accuracy that the hosts couldn't live with. Earls still had plenty to do close to the five metre line but his strength and excellence got the job done. Bleyendaal put over a sensational conversion from the touchline to make it a four-point game. The end-game was all about desperate, almost madcap Edinburgh attack and scramble defence from Munster. Phase after phase, tackle after tackle. The minutes ticked away on Edinburgh. Just as Earls sickened Scotland in the Six Nations with a key score, he did the same here. "If feels more like we lost it than they won it," said Barclay. Life is brutal at this rarefied level. Edinburgh: Graham; Hoyland, Johnstone, Dean, Van der Merwe; Van der Walt, Pyrgos; Schoeman, McInally (capt), Nel, Toolis, Gilchrist, Barclay, Watson, Mata. Replacements: Ford, Dell, Berghan, Bradbury, Ritchie, Shiel, Hickey, Bennett. Munster: Haley; Conway, Farrell, R Scannell, Earls; Carbery, Murray; Kilcoyne, N Scannell, Ryan, Kleyn, Beirne, O'Mahony (capt), O'Donoghue, Stander. Replacements: Marshall, Loughman, Archer, Holland, Botha, Mathewson, Bleyendaal, Goggin.